AVALON — Fishing teams are cordially invited to join in Catalina Island’s only jackpot billfish tournament from Sept. 16-18. Russ Armstrong and his wife started Avalon Billfish Challenge, currently in its fourth year, after they saw jackpot billfish tournaments had gone away. Armstrong, a resident of Catalina for nearly 47 years and an avid fisherman, said he has been participating in Bisbee’s Black & Blue event for more than 30 years. The Billfish Challenge is mostly a tag and release sportsfishing contest, though there will also be a game fish division with categories for tuna, dorado and yellowtail. Fishermen will have his or her chance to compete based on a point system. There were 44 marlin catches, 42 releases and two weighed in previous events, indicating the event is usually quite active, according to Armstrong. “It’s a fun tournament with very competitive guys, but we like to enjoy ourselves,” Armstrong added. The captain’s meeting to kick off the two-day fishing event will be held at Catalina Cantina on Sept. 16. 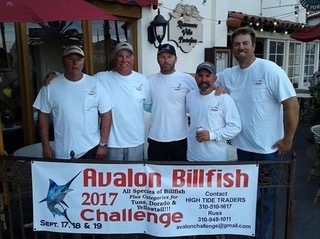 A dinner will be hosted on the final evening to announce the winners of Avalon Billfish Challenge. The base entry fee for the tournament is $2,500 per boat. Catalina Cantina is located at 313 Crescent Ave. in Avalon. Contact Russ Armstrong at 310-948-1011 or email avalonchallenge@gmail.com. Interested parties can also follow Avalon Billfish Challenge on Facebook (@avalonbillfishchallenge).